The UCLA/Getty Program—with a lot of help from our friends—is hosting the 2013 annual meeting of the Association of North American Graduate Programs in Conservation on April 25-27. This is the first time ever that this meeting will take place in Los Angeles! We’re so excited that our students designed the swank logo for the conference L-A-NAGPIC 2013. This meeting brings together students, faculty and staff from North American programs offering graduate degrees in conservation, including Buffalo State College, NYU (Conservation Center of the Institute of Fine Arts), Queens University, UCLA/Getty, the Winterthur-University of Delaware Program in art Conservation, and the Straus Center at Harvard which offers graduate fellowships. We are expecting close to 160 guests to visit in April. Student papers will be presented on April 26 at the Getty Center, with twelve talks covering a broad array of topics in the conservation and preservation of cultural heritage including silk textiles, a 17th century manuscript, a painting by Georges Seurat, an orangutan taxidermy specimen, pinball art, and plant-based contemporary art as a sampling. Our own students at the UCLA/Getty Program in Archaeological and Ethnographic Conservation will present two papers: Caitlin Mahony is presenting her research and treatment of an American Indian quillwork leather vest in the collection of the Fowler Museum at UCLA, and Casey Mallinckrodt will present her technical research and condition assessment of a Ptolemaic Egyptian sarcophagus from the San Diego Museum of Man. Their abstracts follow this post. The second day of talks at the UCLA Lenart Auditorium, in the Fowler Museum on Saturday April 27, includes an Honorary Angelica Rudenstine Lecture presented by Robyn Sloggett, Director of the Centre for Cultural Materials Conservation at the University of Melbourne, Australia. Prof. Sloggett’s compelling topic is “Why conservation is critical to the future of our planet”. This lecture will be followed by our own Andrew W. Mellon Education Resident and Visiting Assistant Professor Tharron Bloomfield, moderating a panel discussion that builds on the specialties emphasized in the UCLA/Getty Program. “Conserving Communities” will include an indigenous archaeologist Desiree Martinez, an indigenous textile conservator Rangi Tena koe, as well as Judy Baca and Robyn Sloggett, scholars whose own work in preservation incorporates community members. Saturday will include a poster session with three UCLA/Getty posters, one authored by three students describing varied approaches to American Indian leather moccasin repairs, another about the use of pigment identification performed on the Ptolemaic child sarcophagus lid as an aid in identifying reused structural elements, and a third poster about the associated values considered in the development of a site management plan for the location of the Woodstock Festival of 1969. 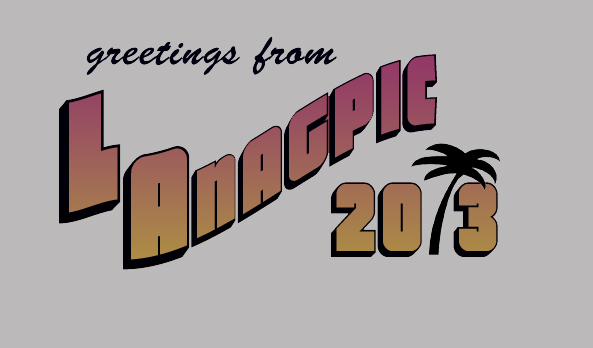 ANAGPIC 2013 promises to promote research, conservation excellence, fun and SoCal weather! In the fall of 2012, treatment was undertaken on a leather Native American vest with quillwork decoration. This paper will discuss the challenges that were encountered during the mending of the damaged leather and solutions that were found, which provided stability without further compromising the condition of the substrate. The vest to be discussed is from the Fowler Museum and is loosely attributed to the Sisseton (Santee) Sioux Indians. Its major condition issues were creases, tears, and losses to the leather, especially in the armhole region, which presumably occurred from repeated abrasion and exposure to moisture from extensive use. Pervasive insect damage throughout the quillwork left a significant amount of quills lost, lifting, or insecure and in need of stabilization. An analysis of a sample of collagen fibers from the leather revealed a shrinkage temperature in the range of 32-36, far below the range that would be expected of stable oil tanned leather, as is commonly used by the tribes of the Sioux Nations. Due to the instability of the leather, it was deemed necessary to develop a treatment that would avoid excessive use of solvents, exclude any use of water, and avoid using heat to reactivate adhesives. After evaluating several adhesives and carriers through the development and testing of mock repairs with chamois, an interior hinge system of Reemay with adhesive film that reactivated with solvent was used with great success. The same adhesive film with Tyvek carrier was used to stabilize broken and lifting quills. The mends to the leather and quill both demonstrated a desired strength and flexibility. Details of these mending procedures will be discussed as well as the decision-making process that determined the treatment materials and methods. It is well known that Egyptians constructed highly elaborate and protective structures to transport the dead into the afterlife. While it might seem inconsistent that coffins would be emptied of their inhabitants and repurposed, in the approximately 3000 thousand years during which ancient Egyptian funerary practices involved decorated coffins, there is evidence of significant reuse to meet the needs of the always-flourishing funerary business. Through the waves of “Egyptomania” that began after the 18th century rediscovery of ancient Egyptian tombs, coffin parts have been repurposed to meet the demands of collectors. The first stages of the technical analysis of a Ptolemaic Child Sarcophagus from the San Diego Museum of Man has revealed the possibility that both the foot block and the carved face may have been reused from different coffins and at different times. This talk will describe the structural and stylistic differences that suggested reuse, describe the analytic methods used to distinguish the component parts, and present the relevant results of the analysis. The content of scholarly consultation and research will be presented including a discussion of both ancient and modern contexts of reuse. The description of the structure and methods of manufacture will be accompanied by graphic illustrations and x-radiographic images. Comparison of pigment mixtures and the microstructure of particles from the head, body and foot will be accompanied by photomicrographs, x-ray fluorescence analysis, and forensic photographic images that demonstrate the presence of Egyptian blue. It is hoped that this talk will offer meaningful information about the effectiveness of these analytic techniques in exploring characteristic differences in components of an ancient object, as well as considering the pathway this object might have taken from Ptolemaic Egypt to a conservation lab in coastal California. Categories: ANAGPIC, Conferences | Tags: ANAGPIC 2013, conference, conservation, LA | Permalink. Make sure to visit the blog later in April for more on our participation in this year’s ANAGPIC conference. Categories: ANAGPIC, Conferences | Permalink.